Description: Exceptional image quality at highly efficient print speeds of 42 pages per minute combine with superior scanning and copy capabilities to boost productivity. Advanced integrated business applications enable the device to transcend the boundaries of traditional multifunctional printers, creating powerful solutions that fuel performance while simplifying document workflow. 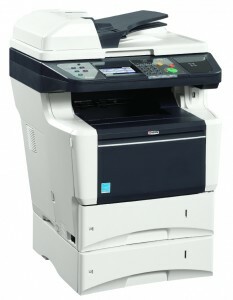 Kyocera’s advanced, award-winning ECOSYS technology is well regarded as a cost-effective and highly reliable solution. Energy use has been reduced and most replacement parts eliminated or replaced with long life components. As a result, with the FS-3540MFP you are able to enjoy the benefits of document imaging devices that lower operating costs, minimize downtime, and maximize efficiency. Original Size 8.5" – 14"